Clean-out unusable space and help unfragment your tables to speed up your site and avoid space errors across the cart. ONLY relevant to VPASP sites that use a SQLServer database. When you delete and then create/recreate records in a table in a SQLServer database, the space that was originally being used for the now-deleted records will still be "reserved" for that table. This means that after a while some of your tables will be reserving/using a large amount of empty-space that serves no purpose, and when this reaches a certain level your overall database will start running out of space and the database will generally become "fragmented". That fragmentation will slow the site down substantially, and the lack of space will cause errors across the whole site/sytem when you reach the space limit. To free-up that unusable reserved space so that it can be used for real data and log files etc, the "CLEANTABLE" SQLServer command can be issued. 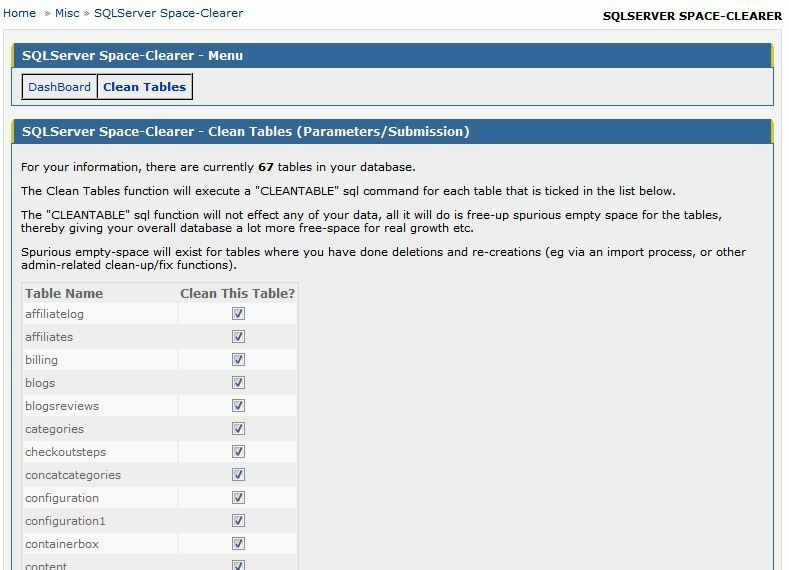 The SQLServer Space-Clearer is a simple/quick way of reliably clearing such space for any/all of your tables at the click of a button from VPASP Admin - it will run the "CLEANTABLE" command for all the tables that you tick on the parameter block. By default, all tables in your database will be "ticked", but you can untick/tick whichever tables you want. There is no need for you to configure/list which tables are available; the SQLServer Space-Clearer will automatically find and list all the tables that are in your database for you. So if you add a new table, or drop an existing table, the SQLServer Space-Clearer will continue to do its job without you having to change its configuration/installation. It will show you a progress/results block, listing the individual tables that are going through the cleaning process, and it will show you any that fail the cleaning process (eg if they're locked-out temporarily because they're being written-to by another process). This is not just relevant to tables that have records deleted/recreated, but also to tables that have had COLUMNS dropped at sometime in the past.